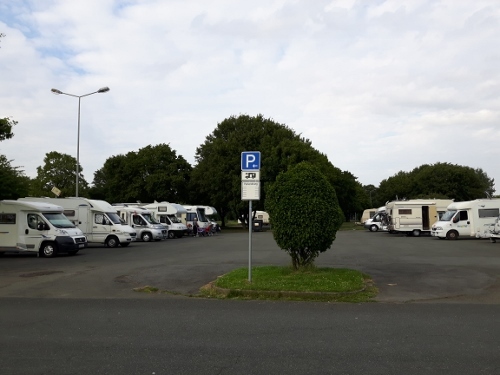 Below is the overview of the different parking / camping areas we have been to during our camper adventure in Eastern Germany and in the Harz Region from June 26 – August 8, 2016. A rather big parking area located near the Burger Park reserved for mobile home vehicles. It could accomodate at least 16 RVs. It is about 1.5 kilometers to the city center which could be reached by a nice stroll in the park, following the Oker river, or by cycling. It is free of charge, but Rvs can stay here for a maximum of two days. There are facilities like clean water, electricity and place for chemical toilet. Possible to bike up to Wolfenbuttel. It is a big mix parking area located along the riverbank, near the Marienbridge .Official parking area costs 7 euro per day, but since we parked a little further from the official area, it was free. It is about 1 kilometer from the city center. There are further no other facilities. The area is also the gathering point of Dresden police force when there is a football match in the city. A parking area reserved for campers. Fee is 5 euro per day. Water and electricity can be obtained for a small price. There is facility for chemical toilet and waste water. The centre is about 1.5 kilometer away. Parking area reserved for mobilhomes and big buses. It is situated next to a big parking area for cars . It is free of charge, but overnight stay is not allowed. There are information boards located at the parking area and the hike to Brocken also starts here. 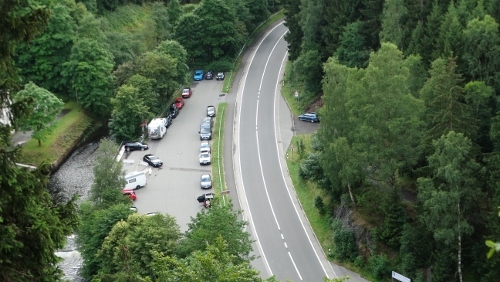 A big mix-parking area at Am Bocksberg, near the stave church where there are at least 8 reserved places for campers. Water is available for 2 euros for 80 liters and there is a possibility to waste the chemical toilet. It is about 500 meters to the small village center and the starting point for the famous walking route, the Liebesbankweg. We stayed here for two nights, upon reporting to the tourist office and paying 4.60 for tourist tax. Internet available at the Tourist office. Small mix-parking with 6 reserved parking areas for mobilhomes. Fee is 10 euro per day, with extra visitor’s fee of 5 euro for overnight stay. 3 hour-stay is 4.50 euro. Facilities for water, electricity and chemical toilet are present. Old town is about 10 minutes walk. Free parking area near the waterfall. It is also the starting point of the hike in Okertal. No other facilities. It is a big mix-parking area, free of charge, used mainly by visitors of the cable cars and amusement parks in the area. There are no other services, not even a waste container! It was busy during the day, but really quiet at night. We stayed here for 3 days, from July 23-25, 2016. Parking area specially reserved for mobilhomes at parking Am Katzenteich. Fee is 5 euro and you can stay there as long as you want. There is place for at least 16 mobile homes; water filling is 1 euro per 40 liters, electricity is 1 euro per 1 kwh. The Altstadt is about 1 kilometer walk. We stayed here for 5 days, from July 17-21, 2016. The parking costs 4 euro a day; there is a ticket machine at the area. Nice location, by the Stadthafen, where one can play volleyball, hire a bbq table, or do a boat tour. Most of the parking spaces are reserved; one has to drive as little further at the back. It is about 1 kilometer to the city center, which can be reached through 15-minute walk or by biking. There are no other facilities. Parking area along the Elbe River where boat tours normally start. Fee is 8 euro (it seemed that one can stay here as long as he want), which you pay upon driving through an automatic port. Facilities for clean water and chemical toilet are present; no electricity. There is a nice view of the Elbe river and we saw the coming and going of tourboats. A beach bar is on the corner; the city is about 1.5 kilometer away; and there are nice biking routes along the river. The place is busy and a bit noisy (summer period). But for the rest, we have enjoyed our stay here. We stayed here for 4 days. It is a spacious free parking area reserved for campers. Location is very nice, with view of the Salzgitter See. There are facilities present like water, electricity and emptying of chemical toilet. A nice place to relax, stroll or cycle around the lake. The city is about 1.5 kilometer aaway. It is at the reserved parking area for campers at the parking lot by Autostadt. Fee is 6 euro per day, including electricity and water. But because we didn’t have the need for such, we just parked at the P3 for 3 euro per day (with permission from the parking authorities). The area is of course, ideal to visit the Autostadt, and also the city center, the castle and the Allersee. We stayed here for three days, from July 5-7, 2016. The fee is 7 euro/24 hours; the area has complete facilities for mobile homes . Water and electricity can be obtained for a small price. We stayed here on August 8, 2016.